The lumber industries and Buffalo Bolt drew Poles to the Niagara County city of North Tonawanda as early as 1880. As more families moved into the Lumber City the community began organizing with the hopes of establishing their own parish. In 1902, Joseph Januszewski and Peter Jesella were selected to plead their case to Bishop Quigley for a Polish church. Seeing that there were enough members to sustain a parish, the bishop sent Father Peter Szulca to establish the church. Father Szulca’s time with the North Tonawandans was short and soon Reverend Peter Letocha took over the small band of Catholics. Father Letocha purchased an old Baptist church, had it remodeled and on May 1, 1903 formally established the parish of Our Lady of Czestochowa. On May 3, Polish Constitution Day, the first Mass in their new church building was held and Joseph Januszewski and Peter Jesella became the first trustees. That fall the parish opened a school in a two story brick building with 93 students instructed by lay teachers. The Felician Sisters would take over teaching in 1908. As the parish grew, Joseph Cyran, Paul Miklasz, Gregory Cyganek, and John Matla would each become a lay leader of the parish while Father Letocha ran the church. 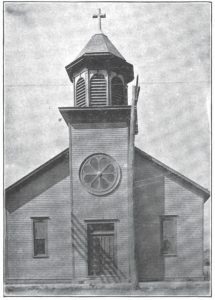 The parish purchased its school in 1907 and the church was blessed in the same year. In 1912 Father Bubacz, the new priest at Our Lady, hired famed Polish American architect Wladyslaw H. Zawadzki to build a rectory for the church. Zawadzki would be hired again in 1919 to build the school complex that still stands near the corner of Oliver and Center Streets. 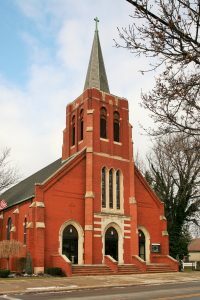 It was under the church’s third priest, the Reverend Bernard A. Bendkowski, that a permanent brick church was constructed. Designed by the firm who worked on Buffalo’s city hall, Dietel & Wade, the new church’s groundbreaking ceremony was held on September 25, 1927. The finished structure was blessed on December 9, 1928. In time, the building was filled with stained glass windows depicting King Jan Casimir crowning Mary Queen of Poland, Abbott Augustyn Kordecki praying for protection during the siege of Jasna Gora, Mary with St. Casimir, St. Stanislaus Kostka, and St. Stanislaus Szczepanow, as well as murals by Joseph Mazur. The parish also ended up with a rarity amongst churches, a Wurlitzer Organ which was produced in North Tonawanda. Father Walek oversaw the parish through the Great Depression and World War II. He worked to reduce the parish debt, bringing it down to $118,000, and revitalized and redecorated the building. In the 1970s the parish school was joined with Ascension parish’s parochial school, utilizing both locations and St. Joseph’s school would join the cluster in 1990. The 1980s saw an increase in parishioners as 250 more families joined under Father Sobierajski. He would also add a shrine to Our Lady of Czestochowa which Pope John Paul II gave his blessing to in 1983. In 2003, a Centennial Committee was formed and added to the campus a set of outdoor Stations of the Cross and a Centennial Walkway in the grotto. As part of the Journey in Faith and Grace, Our Lady of Czestochowa was merged with St. Joseph’s Church on Payne Avenue in 2008. Saint Joseph’s, with a strong Polish background, was closed and members of both churches now worship at Our Lady of Czestochowa parish. Album Pamiątkowe, Parafii Matki Boskiej Częstochowskie, North Tonawanda, New York. North Tonawanda, NY: Our Lady of Częstochowa Parish, 1945. Print. "Buffalo, N. Y. - Porochial School: North Tonawanda - Holy Mother of Czestochow." The American Contractor [Chicago - New York] 24 May 1919: 60. Print. "Buffalo, N. Y. - Rectory & Parish House - North Tonawanda." The American Contractor[Chicago - New York] 23 July 1910: 46. Print. Ederer, Martin F. "Catholic Polonia in Western New York - 6 North Tonawanda's Polish Parishes." Am-Pol Eagle [Cheektowaga, NY] 13 Jan. 2005: 3. Print. "Ironton Poles Give A Program." The Evening News [North Tonawanda, NY] 21 Aug. 1922: Cover. Print. "Local Poles To Celebrate." The Evening News [North Tonawanda, NY] 24 May 1913: Cover. Print. Our Lady of Czestochowa, North Tonawanda, New York: Diamond Anniversary, 1903-1978. North Tonawanda, NY: Publisher Not Identified, 1978. Print. Our Lady of Czestochowa Parish 1903 - 2003. North Tonawanda: Our Lady of Czestochowa, 2003. Print. Pamiȩtnik Złotego Jubileuszu Parafji Matki Boskiej Czȩstochowskiej, North Tonawanda, New York, 1903-1953. S.l. : S.n., 1953. Print.